Yesterday's journal therapy about Refilling Your Tank did me some good. I decided to take it a step further by making a list of things I love to do, things that bring me joy that I can draw from to refill my tank when my source is getting depleted. The idea is to replenish our energy, to recharge and renew by allowing ourselves time for self-care and engaging in activities that make us smile on the inside. We owe it to ourselves and to the people we care about to recognize when our tank is low and to refill it so we can be more present for all the demands of life. Even ten minutes a day of a uniquely-yours-joy-filled experience can bring you back to a better place. These are the little things that bring big fulfillment. 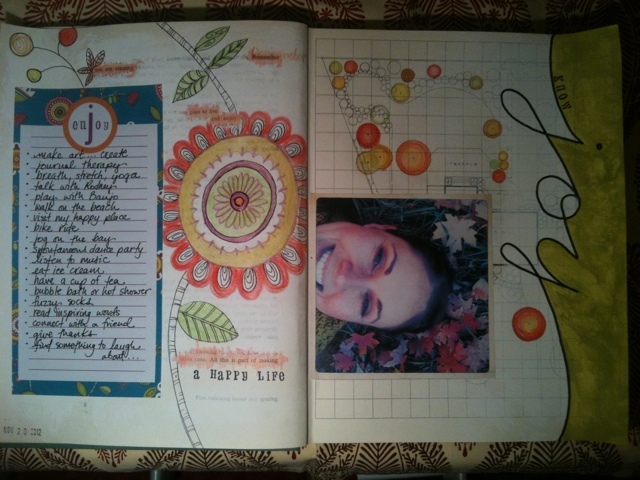 My list turned into an art journal spread in an altered book that I'm making to document my creative process and journey. The photo is a recent one from my trip to Zion- a joyful roll in the leaves. The bits of text that spoke to me from the page found me, as they always do, when I go in search of answers through art. I believe that we have the power to create our happy lives by choosing to make time for the things we enjoy. In the midst of all the chaos, we can know joy. What is on your Joy List? Found text: "Remember, you are creating. Plan to live and enjoy. Knowing takes time. All this is part of making a happy life. Know joy."